1. Reserve the 3 smallest parsnips, then roughly chop the remainder. Melt half the butter in a large saucepan and fry the onions and chopped parsnips for 5 minutes, stirring frequently. Add the stock and curry paste or powder and bring to a gentle simmer. Cover with a lid and cook for 15 minutes or until the parsnips are very tender. 2. Meanwhile, cut the reserved 3 parsnips lengthways with a vegetable peeler into very thin slices. Melt the remaining butter and gently fry the parsnips for 8-10 minutes or until tender and golden. 2. Stir half the coriander into the soup. Blend until smooth using a stick blender or food processor. Reheat gently in the pan, stirring in the apple sauce and seasoning. 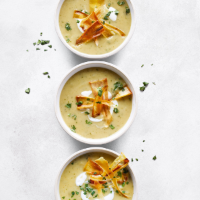 Ladle into bowls, top with parsnip slices, spoonfuls of crème fraîche and more coriander. This recipe was first published in Sun Sep 10 14:20:27 BST 2017.